Some kids can sleep well in their carseats. However, by the time they grow into a booster seat, getting comfortable can be tricky. One way to help the comfort level is to use a seatbelt pillow. I just learned about a cute one from Blue Butterfly Boutique! I love that these were designed by a mom, and her daughter (pictured below) helped design 2 zipper pockets for her “valuables.” You can customize the fabric for your child and they are reasonably priced at $15. We bought one and used it for our spring break travels. The velcro made it easy to attach or put it aside for later. 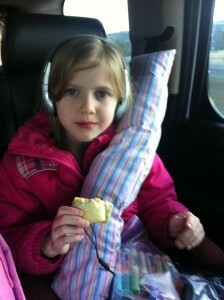 My daughter (below) was very comfortable with her pillow and enjoyed our recent road trip. And she definitely loved her little pockets! Where can you buy this cute pillows? Try their facebook page or their etsy store and tell them Happy Little Travelers sent you. Happy travels! These are great. 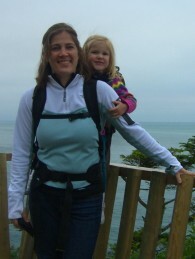 Do you know of any that attach to a car seat for toddlers? 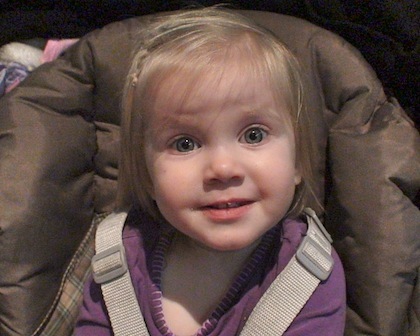 Elli has been looking much more uncomfortable in her new carseat. It’s more upright than her last one.